(A) complex with non-zero positive imaginary part. (B) complex with non-zero negative imaginary part. Q3. Match the CORRECT pairs. Q9. Consider one-dimensional steady state heat conduction, without heat generation, in a plane wall; with boundary conditions as shown in the figure below. The conductivity of the wall is given by k = k0 + bT; where k0 and b are positive constants, and T is temperature. Q11. Match the CORRECT pairs. (A) equal to the jet speed. (B) equal to half of the jet speed. (C) equal to twice the jet speed. (D) independent of the jet speed. Q19. Consider one-dimensional steady state heat conduction along x-axis (0 ≤ x ≤ L), through a plane wall with the boundary surfaces (x=0 and x=L) maintained at temperatures of 0°C and 100°C. Heat is generated uniformly throughout the wall. Choose the CORRECT statement. (A) The direction of heat transfer will be from the surface at 100°C to the surface at 0°C. (B) The maximum temperature inside the wall must be greater than 100°C. (C) The temperature distribution is linear within the wall. (D) The temperature distribution is symmetric about the mid-plane of the wall. Q25. Choose the CORRECT set of functions, which are linearly dependent. Q26. The following surface integral is to be evaluated over a sphere for the given steady velocity vector field F = xi + yj + zk defined with respect to a Cartesian coordinate system having i, j and k as unit base vectors. Q36. A linear programming problem is shown below. 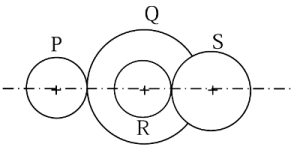 (A) an unbounded objective function. (B) exactly one optimal solution. (C) exactly two optimal solutions. (D) infinitely many optimal solutions. 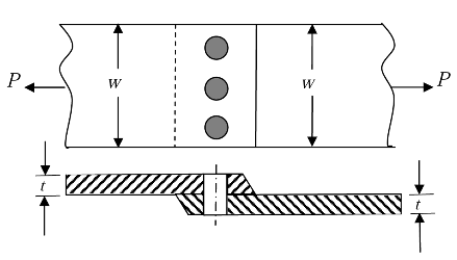 A single riveted lap joint of two similar plates as shown in the figure below has the following geometrical and material details. width of the plate w = 200 mm, thickness of the plate t = 5 mm, number of rivets n = 3, diameter of the rivet dr = 10 mm, diameter of the rivet hole dh = 11 mm, allowable tensile stress of the plate σp = 200 MPa, allowable shear stress of the rivet σs = 100 MPa and allowable bearing stress of the rivet σc = 150 MPa. In orthogonal turning of a bar of 100 mm diameter with a feed of 0.25 mm/rev, depth of cut of 4 mm and cutting velocity of 90 m/min, it is observed that the main (tangential) cutting force is perpendicular to the friction force acting at the chip-tool interface. The main (tangential) cutting force is 1500 N.
In a simple Brayton cycle, the pressure ratio is 8 and temperatures at the entrance of compressor and turbine are 300 K and 1400 K, respectively. Both compressor and gas turbine have isentropic efficiencies equal to 0.8. For the as, assume a constant value of cp (specific heat at constant pressure) equal to 1 kJ/kgK and ratio of specific heats as 1.4. Neglect changes in kinetic and potential energies.